The collaboration between MI and the World Economic Forum offers MI and its members opportunities to strengthen public private collaboration, pursue bold ideas for accelerating energy innovation, and engage in dialogue events. 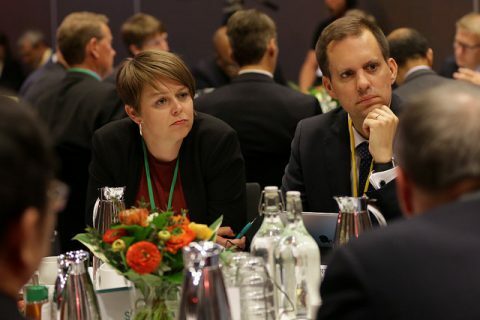 This builds on the outcomes of MI-3, where Cheryl Martin, the Managing Director of the Forum facilitated roundtable public-private partnership discussions on five key technology areas. The Forum is ready to work with MI and directly with MI Members interested in exploring implementation opportunities. The Forum, supported by their project partner KPMG, is ready to work with MI and directly with MI Members interested in exploring how to implement selected bold ideas, which might find traction taking account of country-specific needs. Recently, the Forum and the UK MI team co-hosted an event in London to discuss how the bold ideas could be implemented to accelerate energy innovation in the UK. Building on outcomes from MI-3 and the UK workshop, opportunities are currently being explored with the European Commission, UK and India. This work may include national workshops in partnership with MI countries and/or more specific design of instruments. Note that admission policies apply to Forum summits. Please contact Espen Mehlum for further information on engagement opportunities.